After the boys broke in their new “man” toy with some chicken and steak skewers, I planned a weeknight dinner for the hubs and I to test out the first of said veggie kebab recipes. But then…it was cold. Like, really cold. Maybe in the 40’s, and so windy that grilling would be a total nuisance, with smoke gusting into unwanted places like my face and hair (yuck), as I stood over a hot grill in a puffy coat and snow boots. No thank you. So I did the next best thing to cook those big chunks of zucchini, mushroom, and red onion that I had prepped earlier in the day when I was feeling extra organized: threw them onto a big sheet pan, hit them with a little oil and seasoning (and the mushrooms with a simple, flavorful, improvised marinade), skipped the skewers (flammable!) that I had made a special trip to purchase, and let the whole tray roast in a nice hot oven. Without much method to my madness, the veggies all came out nice and caramelized, just the right amount of browned, the tomatoes slightly burst and juicy, and the onion sweet and tender. We enjoyed them that night with vegan sausage and tangy avocado dip, which was totally unnecessary seeing as how delicious the vegetables were on their own. Then, the magic really happened the next day when I fashioned loads of on-sale organic kale into a sort of Italian kale salad. Balsamic, parmesan, tomatoes…Italian, right? Whatever you want to call it or not call it, it’s a healthy, filling winter-to-spring transition dinner. 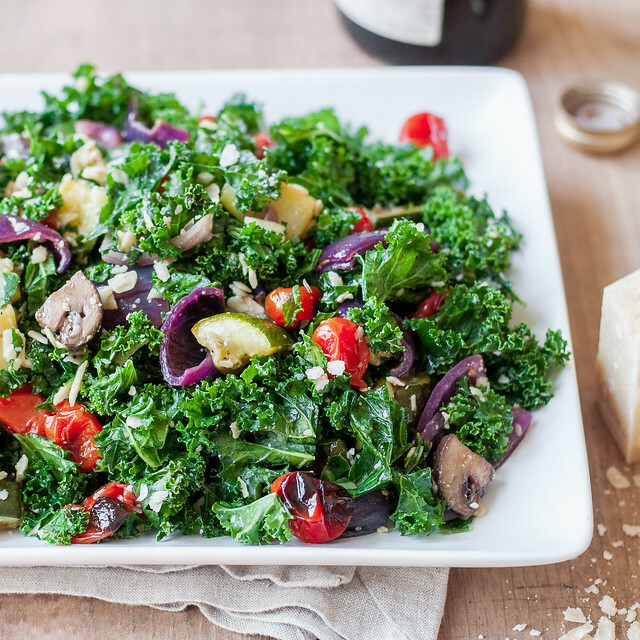 A transition I wish we were not still in, but if we have to be, I’ll continue to occupy it with warm roasted veggies, fresh kale salad, and just enough parmesan to help me ease off of my winter cheese-with-every-meal habit. 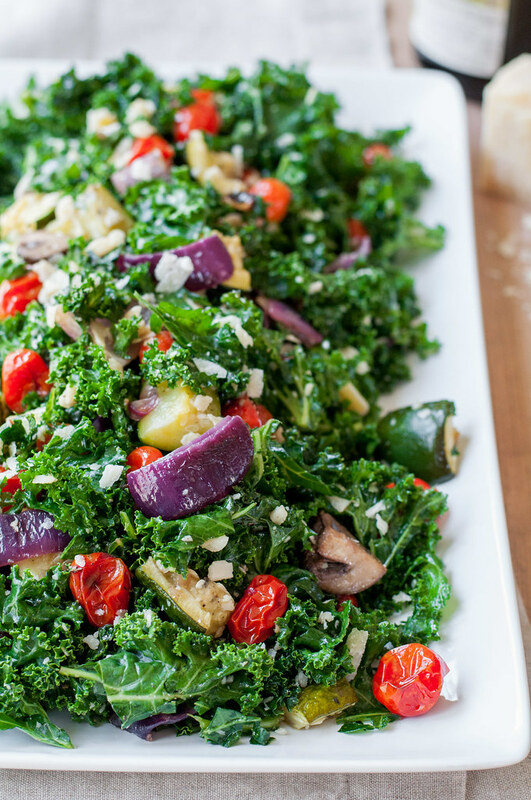 Kale salad only gets better with age, making it an awesome, non-soggy make ahead lunch salad. The dressing continues to marinate and tenderize the kale, without rendering it sad and droopy. You can make and store the salad in its entirety for three to four days, or even five if you like to live on the edge. Keep refrigerated until an hour before you plan to eat it. Gluten free/vegetarian/easily vegan. 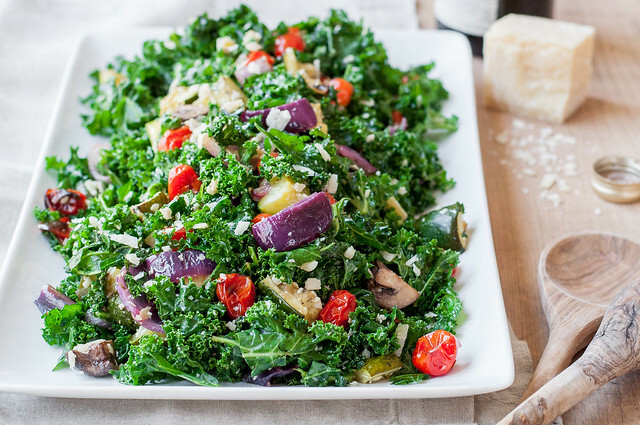 You'll barely notice the kale in this loaded vegetarian salad, if that's your goal. A little parmesan lends an almost creamy texture, and juices from the caramelized veggies add another dimension of flavor to every bite. Easily an entrée salad! In a bowl large enough to hold the mushrooms, mix 2 tablespoons olive oil, 1 tablespoon balsamic, tamari, garlic, dried herbs, shallot, a generous pinch of pepper, and half the lemon juice. Add mushrooms and toss to coat. Cover and let stand at room temperature for 30 minutes to an hour. Preheat oven to 425 (F). Toss tomatoes, zucchini, and onion with 3 tablespoons olive oil and plenty of salt and pepper. Spread vegetables in a single layer over most of a rimmed baking sheet, adding the mushrooms to the pan in a separate corner so they can be easily removed first, if needed. Roast vegetables in uppermost oven rack for 15 minutes. If mushrooms appear golden in places and are tender, remove from the pan. Continue roasting vegetables for 5 to 10 minutes until all are beginning to brown in places. Let cool on the pan. In a mixing bowl, sprinkle kale with a little salt and squeeze fistfuls for a few minutes until it's bright green, fragrant, and less stiff. Toss with a tablespoon of olive oil. Add a splash of balsamic vinegar, the remaining lemon juice, and half the parmesan and toss to coat. Season with salt and pepper. 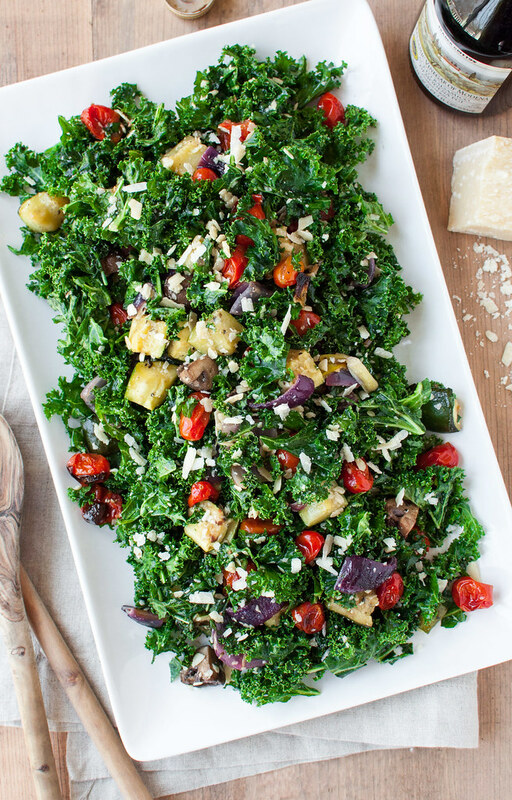 Toss dressed kale with roasted veggies and and pass extra parmesan cheese at the table. Prep and cook times don't include inactive time for marinating the mushrooms. 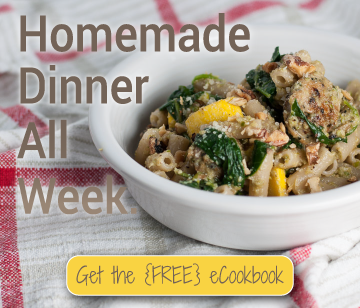 To make it vegan, skip the parmesan or use a vegan cheese or a sprinkling of nutritional yeast. For strict vegetarians (not just meatless), make sure to use vegetarian parmesan.